Text: Origins. 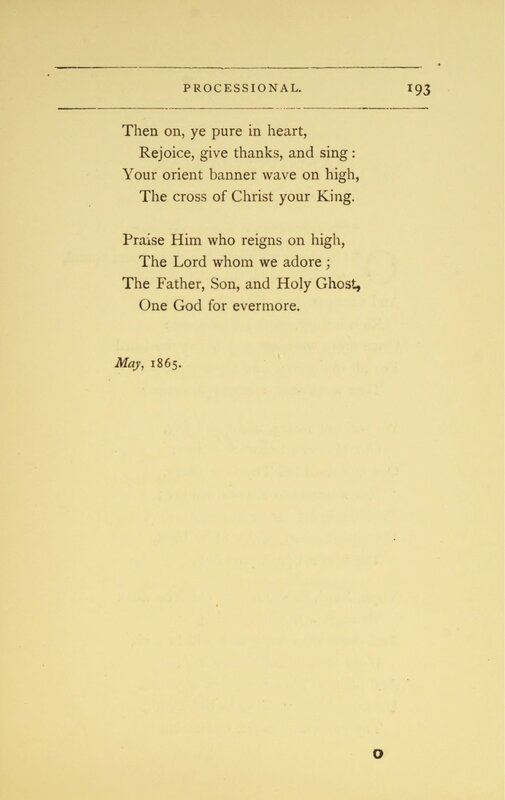 This hymn by Edward Plumptre (1821–1891) was written in May 1865 and first published in the third edition of his Lazarus and Other Poems (1868 | Fig. 1) in twelve stanzas of four lines, without music. In his collection, it is headed “Processional,” giving an indication of its intended usage. It also includes a quote from Psalm 20:5, “In the name of our God we will set up our banners” (KJV). At the time, Plumptre was Professor of Exegesis at King’s College, London. His hymn was first performed at the Peterborough Cathedral, England (website), and used at the Peterborough Choral Festival of 1865. That year, it was also published as sheet music by Novello with a musical setting, now lost. Fig. 1. Edward Plumptre, Lazarus and Other Poems, 3rd ed. (London: Strahan & Co., 1868). Tune 1. 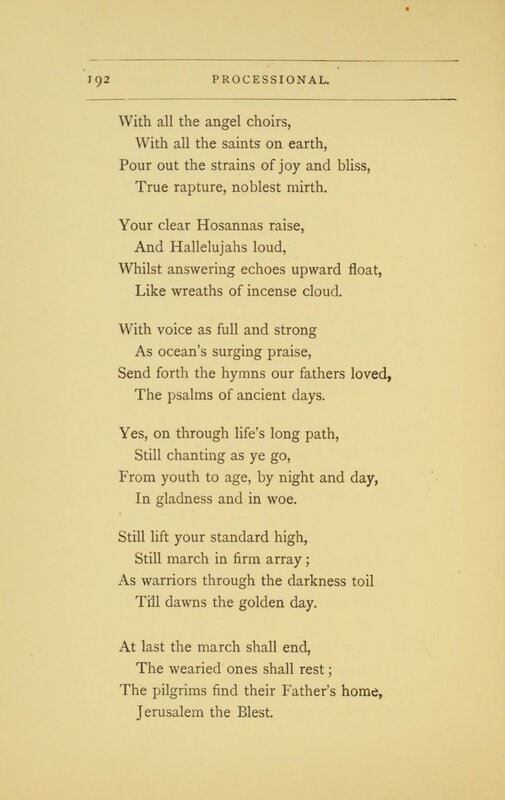 In 1868, Plumptre’s hymn was adopted into the Appendix of Hymns Ancient & Modern (1868 | Fig. 2), minus the fourth stanza, and replacing “orient banners” with “festal banners” in two places. John Julian, in his Dictionary of Hymnology (1892), p. 897, referred to this revision as the “authorized” (official) version of the text, but these changes were not carried over into Pumptre’s fourth edition of Lazarus (1884). The musical setting was a new tune by William Henry Monk (1823-1889), appropriately named PETERBOROUGH. Fig. 2. Hymns Ancient & Modern with Appendix (London: William Clowes & Sons, 1868). It shall be the duty of every minister of this church, with such assistance as he may see fit to employ from persons skilled in music, to give order concerning the tunes to be sung at any time in his church; and especially, it shall be his duty to suppress all light and unseemly music, and all indecency and irreverence in the performance, by which vain and ungodly persons profane the services of the sanctuary. The first part, the need to supply necessary tunes, gave rise to multiple music editions, including an edition produced by Charles Hutchins (1838–1920) of Grace Church, Medford, Massachusetts, another produced by John Ireland Tucker (1819–1895) & William Rousseau for the Holy Cross Church, Troy, New York, and an edition produced by Arthur H. Messiter (1834–1916), organist of Trinity Church, New York City. Messiter’s edition included his rousing and enduring tune MARION, dated 1883, using Plumptre’s text with an added refrain: “Rejoice, rejoice, rejoice, give thanks and sing” (Fig. 3). The refrain has a fanfare-like quality that echoes the main idea of the text and enhances the grandeur of the processional ritual. Messiter is said to have named the tune after his mother. 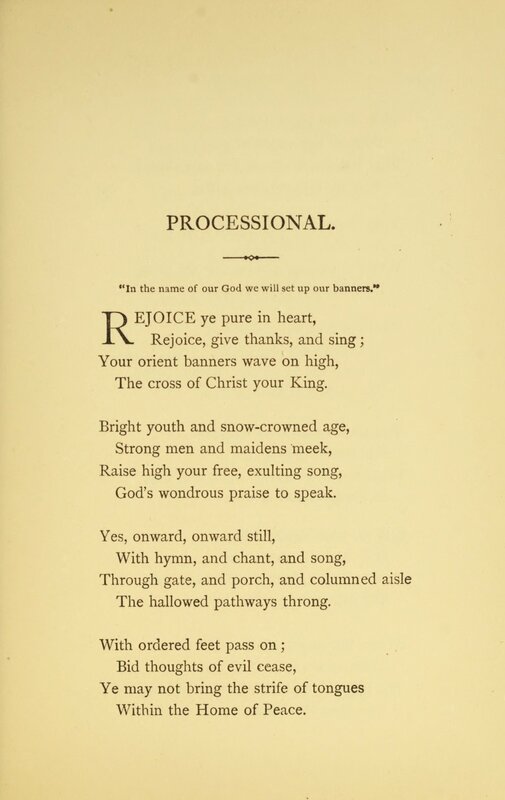 In his History of the Choir and Music of Trinity Church (NY: Edwin S. Gorham, 1906 | PDF), Messiter indicated he had used this hymn setting in a service to mark the 50th anniversary of the accession of Queen Victoria, 19 June 1887, featuring a choir of 70 voices (p. 230). He did likewise at the 60th anniversary service, 20 June 1897 (p. 284). He also used this hymn at the bicentennial of the church parish, 2 May 1897, with a choir of about 40 men and boys (p. 277). Fig. 3. The Hymnal, Revised and Enlarged with Music As Used in Trinity Church, New York, ed. A.H. Messiter (NY: E. & J.B. Young, 1893). Tune 3. In 1974, composer Richard Wayne Dirksen (1921–2003), who at the time was precentor of the National Cathedral in Washington, D.C., composed a choral anthem based on Plumptre’s text for the installation of Bishop John Maury Allin, sung on 11 June 1974. Dirksen’s setting includes a refrain, “Hosanna, hosanna, rejoice, give thanks and sing.” The sheet music was published by Harold Flammer that same year (Fig. 4). It was first adopted as a hymn tune, VINEYARD HAVEN, in Ecumenical Praise (1977), and it was quickly adopted into other major collections in the United States. Fig. 4. Richard Dirksen, “Rejoice, ye pure in heart,” SATB (Delaware Water Gap, PA: Harold Flammer Music,1974), excerpt. Tune ©1974 Harold Flammer, Inc.
Paul Westermeyer, “Rejoice, ye pure in heart,” Hymnal Companion to Evangelical Lutheran Worship (Minneapolis: Augsburg Fortress, 2010), pp. 758-760. Carl P. Daw Jr., “Rejoice, ye pure in heart,” Glory to God: A Companion (Louisville, KY: Westminster John Knox, 2016), pp. 763-764.